On the 15th anniversary of the implosion of the Kingdome, a King County official said enough lodging-tax revenue has been collected to pay off debt of the former home of the Mariners and Seahawks. Fifteen years after the Kingdome was imploded, King County taxpayers have finally stopped paying for the stadium that was home to the Mariners and Seahawks. King County budget director Dwight Dively said Thursday that enough lodging-tax revenue has been collected to pay off what’s left of the $67.6 million in municipal bonds issued to repair the Kingdome’s tile roof back in 1994. The bonds can’t technically be paid in full until year’s end, so the $18.7 million still owed in principal plus interest will be placed in an escrow account until that time. “It’s been a good couple of years in the hotel industry,’’ Dively said of the lodging tax on hotels and motels used to pay off the debt. “It isn’t just the money that’s come in this year. The last two or three years have been significantly stronger than expected. 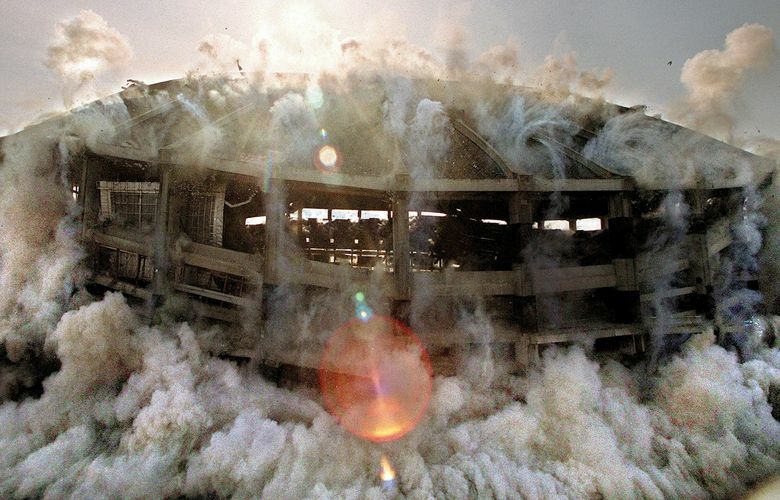 The Kingdome was imploded March 26, 2000 — 15 years ago Thursday — about 24 years after it opened. The hotel/motel tax is 15.6 percent in Seattle, with 2 percent earmarked for Kingdome roof repairs, and is expected to generate $24.8 million for the county this year. Dively said the 2 percent amount no longer needed for the Kingdome will instead go to the 4Culture program, which helps arts, heritage and preservation efforts within the county. King County taxpayers have financed the stadium via municipal bonds since 1972, when construction began on a stadium that opened in 1976. The original $40 million in bonds used for construction costs weren’t paid off until 2011. Water seepage caused four 26-pound ceiling tiles to fall into the seating area July 19, 1994, a half-hour before fans were allowed into the stadium to see the Mariners play the Baltimore Orioles. The Mariners were forced to play their final 20 games that year on the road before the baseball players’ strike ended the season. The Seahawks had to play both home exhibition games and their first three regular-season contests at the University of Washington’s Husky Stadium that year as repairs were completed. Two construction workers died during repairs before the Kingdome reopened in early November, but the falling tiles helped prompt calls to replace the Kingdome with new sports venues that eventually materialized nearby with Safeco Field and CenturyLink Field.